More than 200 people, who were detained during the violent weekend clashes in Paris, will go on trial on Monday and Tuesday. The justice minister vowed ‘harsh’ punishment for the alleged perpetrators. The actions of the Yellow Vest protestors, who clashed with police, blocked roads, burnt cars and caused other mischief, “won’t be left without consequences,” Nicole Belloubet said. On Saturday, police arrested 412 protesters during the worst clashes in Paris in over a decade and more than half of them now face prosecution. French authorities claimed many of the perpetrators were “professionals of disorder,” who already have a criminal record and came to the capital from other parts of the country with the aim of staging havoc. While pinning the blame on protesters, police themselves didn’t mince it tools to curb the unrest on Saturday. These included rubber bullets, tear gas and water cannons. The latter was partly used from extremely close proximity, knocking off several of protesters. Over 130 people were injured in the clashes, among them several RT reporters. But the police also took a beating, with 23 officers requiring medical attention. 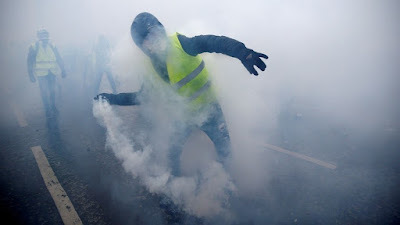 French Prime Minister, Edouard Philippe, had cancelled his appearance at a climate change summit in Poland on Monday to hold talks with French political leaders in order to respond to the violence. However, Jean Bricmont, a French writer and political commentator, told RT the Yellow Vest protest is about something more than just gas prices. People took to the streets to protests the French government and its dependence on Brussels, he said.